Just nostalgia or will Misty raise the veil on a new wave of comics? 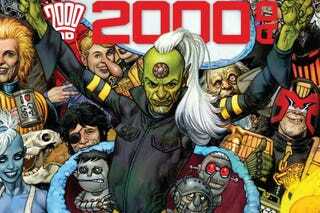 Word has it that last week’s landmark Prog 2000 of 2000A.D. has sold out and a reprint is in the works. And today’s Guardian lauds publisher Rebellion for rebuilding the home of Judge Dredd into one of the UK’s best selling comics. That issue hasn’t penetrated newsagents in this neck of the woods, so I can’t comment on any highs or lows. But in the meantime, there is a wave of speculation that Rebellion could resurrect the fortunes of some other titles that came from the same stables as the Mighty Tharg, Dredd, Strontium Dog et al. The Guardian turns its attention to a reprint collection of two Pat Mills serials from Misty, a Seventies supernatural girls comic. The selected strips are the Carrie-inspired Moonchild and reincarnation-thriller The Four Faces of Eve. Farringdon’s finest David Barnett follows nostalgia with some indulgent musing that this could herald an all-new Misty. However, he isn’t sure his daughter would take to the vintage strip, imagining that she and her peers would consider themselves more sophisticated than the teeny-bopper generation. In it’s day, Misty sold around 170,000 copies a week and it was part of a high circulation range of Fleetway (IPC) girls comics - never mind the competition up in Dundee. Meanwhile, former Marvel UK/Titan guru John Freeman has been pondering the prospects of a new look Buster, revamped for the 21st century. Would a traditional humour title have any traction in today’s market, he asks on his Down The Tubes blog? Broadly the deal gives Rebellion the bulk of strips produced after January 1970, everything before hand stays with the UK wing of Time Warner. So I won’t be getting my new Robot Archie comic unless he joins the Doom Patrol and John’s revived Buster will not include new adventures of Peter Parker (I kid you not, this is one strip DC needs to dust off, turn into a film, or get it out there). There are some odd quirks in this new status quo for sure. It gives Rebellion Whizzer and Chips (two comics in one, double the fun), but, if I understand things correctly, the mascot features Sid’s Snake and Shiner will not be included in any revival. (Coincidentally, the original Illustrated Chips which ran for nearly three thousand issues between 1890 and 1953 was merged into Film Fun which later merged with Buster. And Whizzer and Chips merged into Buster in 1990.) On the other hands a Double Deckers collection is possible. Go Tiger! In parallel with the Rebellion acquisition, Titan have recently launched a new Johnny Red series from Garth Ennis, following the strip from 2000A.D.’s sister weekly, Battle. Apparently they also have plans for HookJaw, Action’s menacing mutant shark (which I thought had been resurrected in Strip Magazine?). There are strips which are either old than people thought or have been sold off in previous deals. This has already thwarted a resurrected version of Frankie Stein and reprints of strips by Ken Reid. Most likely the immediate future will be more reprints, some celebrated and others, well I suppose we will see if we get more. Though all strength to Rebellion’s elbow if they do decide to test the waters with some regular publications. Creating Comics: Could Rebellion Bring Back Buster?